A radio may not be the most attractive thing you own, but ti definitely doesn’t have to be something that gets in the way. Radio experts Pure have gone and taken inspiration from nature by releasing their latest model, the Chameleon Evoke. London, April 1st 2017: Pure announces the launch of the world’s first digital radio that transforms itself to blend into any background, mimicking your personal style in a way like no gadget before. Pure’s original Evoke range of digital radios took inspiration from key colour trends. The new Evoke Chameleon however, takes inspiration from its user’s own style. Just like a chameleon’s skin has its own technique to adapt to its environment, Chameleon’s “skin” adapts to blend seamlessly into the background, visible only by its 3D form. With two presets, (MyStyle and EvokeStyle), the Evoke Chameleon will either change its skin to perfectly match its background, or it will remain its original colour; the Evoke Chameleon comes in a range of seven pantone colours. Users can fine-tune the radio to match any personal style thanks to Pure’s new ChamoTechTM. Pure has taken inspiration from nature with its ChamoTechTM technology. A chameleon’s skin is transparent and beneath are several more layers of skin that contain specialised cells called chromatophores, filled with sacs of different kinds of pigment. When a chameleon experiences changes in body temperature or mood, its nervous system tells specific chromatophores to expand or contract, which changes the colour of the cell. Pure’s ChamoTechTM. technology mimics this process by embedding heat sensors atop artificial chromotophores, which are layered under a thin panel of the Evoke Chameleon’s outer shell (its ‘skin’). The Evoke Chameleon will be available exclusively from http://www.pure.com for SRP £599.99. It features DAB/DAB+ and FM radio as well as Bluetooth connectivity which lets users wirelessly listen to their personal music library from any compatible device. Other features include three separate alarms, kitchen and sleep timer and 30 station presets. 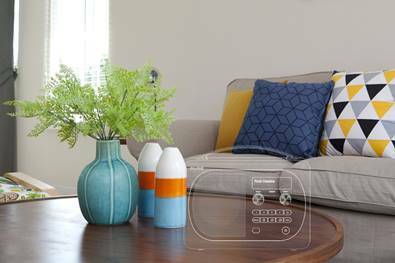 Engineered by Pure’s audio experts, the radio boasts class-leading sound performance which can impressively fill any room in the home.